Can anyone tell me who the actress in this screencap is? Bonus points for film name and year! Another screencap has been added as a further hint. Pankaj Thuain was the first to get this right: she is our favorite scary auntie of the 60s and 70s Manorama! 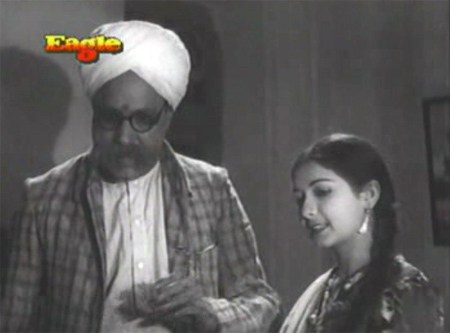 Ash and Simi knew that the film is 1941’s Khazanchi. Although unsubtitled, the storyline matches almost exactly the later 1958 remake by the same name. Manorama plays the hero’s sister Asha; it is a significant part and so fun to watch her. There were definite flashes throughout of the “older” Manorama, although she is really very sweet-faced and pretty. Manorama’s last film was Deepa Mehta’s 2005 film Water, and she was great in it. She passed away in February 2008, and it was hardly noted despite her prolific six-plus decades-long career. Posted on January 24, 2010 at 3:23 pm in Hindi movies, Trivia time	| RSS feed You can skip to the end and leave a reply. I swear its at the tip of my tongue! Now I’m feeling restless – just before my bedtime too. Same here, I recognize her from somewhere! is she madhumathi or one of the item girls at a younger age? No but you have all seen her. She had a very long career in films :) I’ll add another screencap as a further hint! Wah! Pankaj :) You are correct! Manorama was not what was at the tip of my tongue, but now that you mention it could well be. Her right eye (on the left in the picture) resembles Manorama’s eye very much actually. I’d go for Manorama too – though I would never have suspected her of looking like this! On the other hand, Dharam is in fine shape, despite his heavy drinking ways. She has a sweet face. But I cant place her at all. Only one she reminds me of is Leena Chandavarkar. But she wasnt this old. I will be surprised if she turns out to be Manorama. Young Manorama looked very different. For reference here a magazine still of Manorama from year 1945. It has to be Manorama, a very illustrious actress and who was the main lady in many many films in the 30’s and 40’s, a formidable career but yet we know very little about her. And the movie.. well Khazanchi (1941). Inaam Dus Hazar……kya? Ki mein jhoot boleya ? You have to translate Hindi for me Ash! KI MEIN JHOOT BOELYA.. is Punjabi, a very famous Oldie Goldie song Of Rafi Saheb meaning- now did I state a lie/ did I speak the truth. Ha! You will be teaching me Hindi yet, Ash! Koi main jhooth boleya is quite a common expression in Punjabi. Durrani sahab sang it before Rafi in Madari 1950, I think. Must have been sung before as well. I also think she is Manorama. She disappeared for the whole of the 80s and 90s and came back on TV in some serial. I remember seeing her on the small screen when she came back. She had lost all that weight and seemed quite shrunken, but that face and those gestures were still there. And she was the still the evil old chachi or something like that. Was there in a couple of serials more. And then saw her in Water. Did not know she was leading lady once upon a time. Water (if that’s what you are referring to) was made in 2005 and released in 2006—it was up for the Oscar in the March 2007 telecast of the Academy Awards. Time flies as you get older! And I wouldn’t call her a leading lady in this, the very pretty Ramola Devi was the “heroine”…but she did have a big role. No. I meant that you have written that she passed away in Feb 2005. It was Feb 2008. Oh she definitely is. I actually was skeptical and thought that it would be a different Manorama when I started watching the film…but soon realized that it was THE Manorama, despite her youth! It’s very obvious when you watch her in motion, and her facial expressions. yes.. we all got it right!! 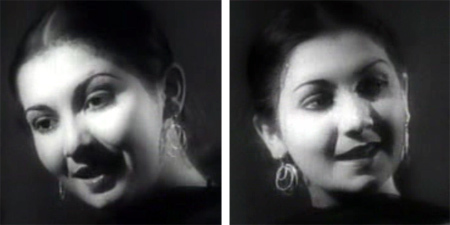 In that second screen cap, Manorama looks like a young Tina Munim. 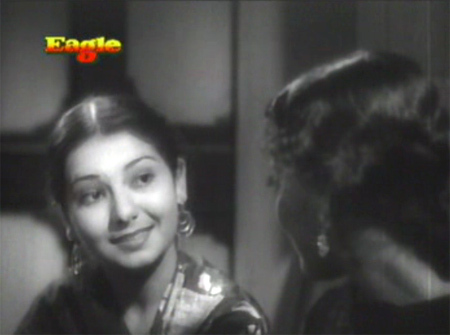 I don’t really know much about Manorama, but I think the face looked familiar because I’ve watched a few of clips from Khazanchi (1941) a number of times. I like the soundtrack, which I downloaded from Surjit Singh. 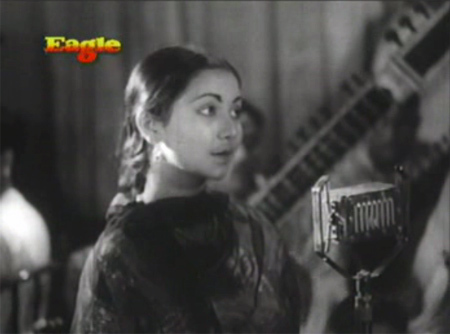 So, I guess Manorama’s singing voice was a very young Shamshad Begum? This is a must see for the viewers, of our beloved Manorama. The SS courtesy ansarivilla.com and to Greta for informing me about this link on N A Ansari, who incidentally is my kiddie hero and still is and am sure we will see a write up sooner than later on this interesting character who has a lot of contribution to the Industry. 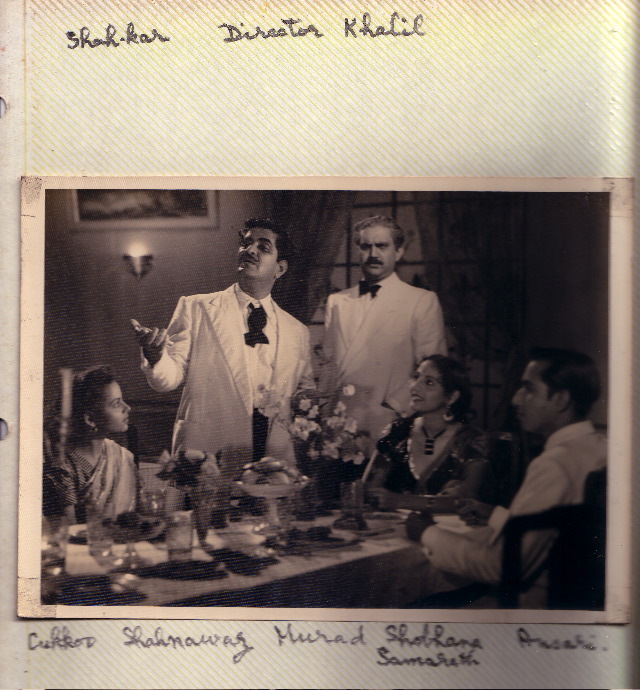 Incidentally the image which is from Sartaj is not listed as it is def from Lahore, from Pre Partition days. The dapper Motilal is also there with NA and sensuous Munwar Sultana. Well I cant help it but yu must see this also, another wonderful SS from yore with Cuckoo, Murad, Shobhana Samarth, N A, Shah Nawaz, Murad. Could never have guessed it ! unfortunately not much information about her biography.